A software-based network strategy enables organizations to be secure and nimble, delivering innovative experiences where and when customers need them, regardless of the underlying infrastructure. Ask a $1.8 billion check-printing company how it remains competitive in today’s rapidly changing business world, and you’ll get a lesson in modern digital transformation. Deluxe Corp., a primarily paper-based company, is changing its business model and focusing its attention on the latest digital solutions, including online checks and digital currencies, in order to meet the demands of customers who require anywhere, anytime access. Today’s end users expect new and immediate access to applications and data from any device. Application developers are creating and delivering apps at extremely fast speeds, while IT is tasked with maintaining high performance, availability, and security on the network. To fulfill these new demands, businesses need to take a smarter approach to their network strategy, shifting from hardware-centric to a software-based networking strategy. By following this path, they are able to better distribute network services to wherever applications reside, independent of the supporting infrastructure. The resulting agility is the very essence of the digital transformation. have little insight into the process, simply submitting requests. manually assign hardware resources as available, slowing the start of the project. must build all security and network management into each application potentially introducing human error. must then review the application within their own siloed systems. are fixed hardware — not flexible for today's rapid application development needs. must wait for improved service and innovations. IT & developers no longer work in silos. get applications and services faster. can exercise the right amount of control and monitoring. deliver network and security services on time for app deployment and throughout the app lifecycle. can be built in to applications and network to meet regulatory standards. can focus on developing core functionality more rapidly. automate tasks speed development, reduce errors, and eliminate bottlenecks. benefit from increased responsiveness by the business. Digital transformation is a reality, pushing businesses to distribute applications to wherever they can deploy them fastest. At the same time, IT still needs to maintain security and compliance. Agile and secure — fundamentals of digital business — are impossible to achieve with a traditional network designed for business as usual. A new approach to their network is needed that distributes network capability to wherever apps need them, independent of underlying infrastructure. Currently, when business analysts want to build a new application, the development process is tied to fixed data centers and infrastructures. For digital businesses, where lines of business and developers move particularly fast, this traditional approach to networking has been starkly at odds with business needs. Applications drive the infrastructure which is not built for this process. Applications take weeks or months to deploy. What's needed now is a new, invisible infrastructure that removes stifling IT silos and enables IT and business staff to better collaborate. Security — Built-in encryption and authentication saves time and money. Network Configuration — Lengthy network provisioning, costly processes and labor-intensive, error prone tasks are now automated to prevent bottlenecks. Application Continuity — Networking and security policies are attached to their associated workloads for easy remote deployment without disrupting apps or the physical network. A software-based network distributes services wherever needed, independent of any underlying hardware infrastructure. Now, applications can be securely developed, deployed, and maintained in a virtual environment where members of different teams can more easily collaborate. Secure — Automation makes tagging a virtual machine and applying firewall rules much faster and easier. Versatile — Better visibility enables staff to see into both new and previously inaccessible legacy systems. Flexible — Software-defined architecture seamlessly expands or contracts to fit changing project and application needs. 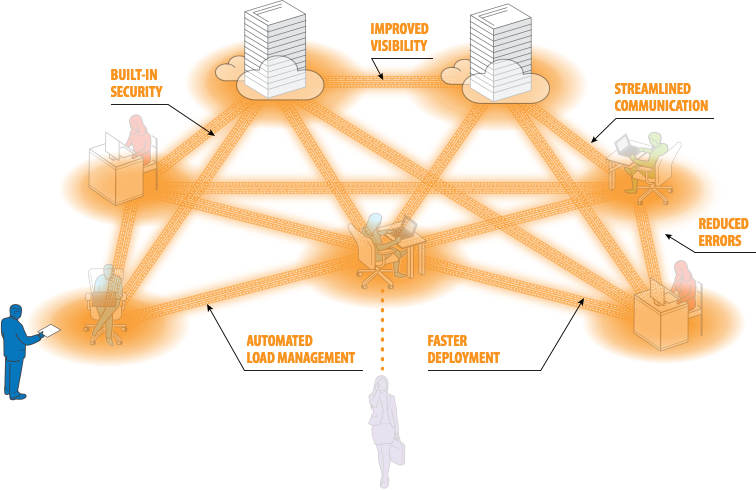 When organizations move away from their slow, restrictive, on-premises hardware-based network infrastructure to a more agile and automated software-based network architecture, they reap measurable and meaningful results, including faster product delivery, higher levels of organizational efficiency, and overall return on investment. Today's digital transformation requires software-based networking — an agnostic IT infrastructure model and a cultural change across IT, developers, and the line of business. As IT provides an agile framework that allows businesses to be self-service, it will also be prepared for future development and deployment. A cultural shift and a modern network strategy in the digital transformation journey will foster innovation and a competitive edge in the near and distant future. The most nimble and savvy organizations are embracing a software-based networking framework for delivering services and distributing apps to internal and external customers more quickly and to where they are the most effective. Such is the case with one large software application company, which is in the midst of a digital network transformation. This company has continuously implemented new technology iterations (including applications, security and storage) over the past several years in order to keep up with internal and external customer demands and to increase productivity. However, the networking infrastructure was lagging. So, the IT team decided that with the advances in virtualization, containerization, and microservices, that it was time to update networking as well. This company, which is still in the early stages of moving to a software-based network, has already seen some benefits from the new strategy. For example, code deployment times were reduced from a few months to just a couple of hours. This organization believes that the new, software approach to networking will help them to scale and will reduce network setup time. “We live in an application-centric world,” says Desai. “What’s needed is an ecosystem where we can deliver automated application blueprints faster, without the need for human intervention.” The application now dictates the infrastructure, and the infrastructure has to support the app, instead of the other way around. This is a growing challenge for IT. They must better align new technology initiatives with business drivers to deliver services and products as quickly as their internal and external customers demand, while retaining operational controls. The traditional ways of supporting the workforce, managing, and securing apps just aren’t meeting today’s business needs. “It’s a shift in mentality in designing for failure and complexity,” says Peder Ulander, vice president of product marketing at VMware. Making the true and complete digital transformation requires rethinking networking and mobility, as well as nurturing the business to become more open in terms of technology and strategy. With applications now driving the infrastructure and developers needing to create and deploy applications immediately, IT must restructure its entire network strategy and embrace software-based approaches. The new digital business calls for not only a technological shift to a software-based network but also a cultural shift—one in which IT, business leaders, and developers must fully embrace a new IT infrastructure and virtual networking strategy. As one IT leader describes it, the cultural shift can be the hardest part of move to a software-based network. This leader describes a slow process, in which technology is the easy part. Convincing team members to get on board is evolving, and the first step is to make sure that IT must be open and willing to adapt. Once that happens, they can become evangelists to the rest of the team and the organization. So, how can this change? The answer is a new, invisible infrastructure that can remove stifling IT silos and enable IT staff and business to better collaborate. 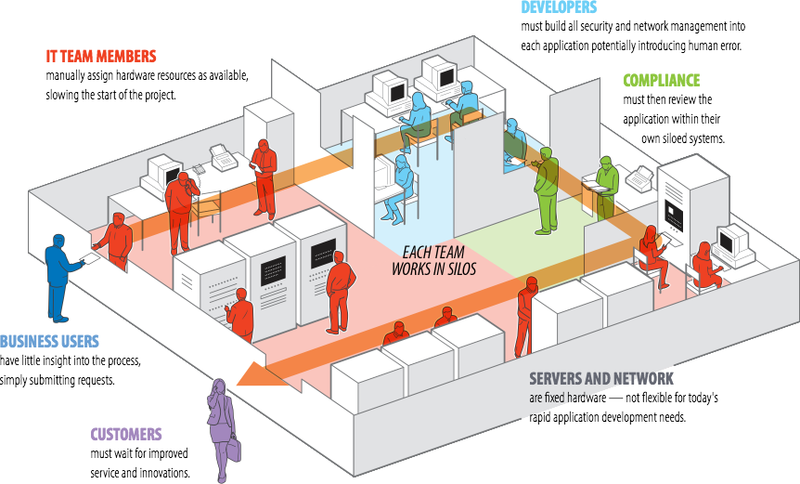 Developers need a network, a security profile, and the ability to communicate with all the back-end systems. Instead of being tied to the data center, the network must operate as a set of data interfaces that can be defined in application layers that are multi-cloud ready. Now, applications are being built, managed, and stored in the cloud, where the organization doesn’t own the infrastructure. Apps are delivered via software instead. “We need to create an agile, open-source environment where people can implement new software immediately,” Maynard-Koran says. “This drastically changes the network ecosystem and allows development cycles to move from years to weeks.” Such speed and agility is essential in the gaming industry, where all gaming is done on a server, requiring fast deployment of software updates and new releases in order to stay competitive. To change the traditional network infrastructure, the first step is to eliminate the physical barrier by removing the physical box. This means decreasing reliance on hardware and increasing reliance on software-based networking and virtual environments—the transformational technologies that truly allow businesses to deliver services when and where they’re needed. This also helps IT and business leaders build logic into the system with real-time capabilities, which help users proactively understand the risks, policies, and analytics that need to change. Cybersecurity is easier too, as security solutions and protocols, anti-malware, and threat protections are built into the system. This is crucial for financial services organizations like Deluxe, which offer mobile applications such as online checks and must adhere to strict compliance regulations while securing financial data. Built-in security also allows faster response for organizations. One IT leader reports that before the switch to software-based security at his organization, specific devices had specific security, requiring individual security measures and compliance monitoring for each device and from each vendor. The switch allows faster reaction. There is no question the digital transformation creates new experiences for IT, users, and customers. These new experiences include flexible infrastructures, software-based networks, and increased automation, which allow an easier connection to the network and the ability to deliver new applications in minutes. Siloed infrastructures are complex, and slow down the application production process. Automation allows the management of servers, switches, monitoring and security at the same time, creating a faster path to scale. A software-based network architecture also allows for easier network abstraction from the physical network anywhere and anytime. That is, to operate with greater agility, automation and to deliver network services at will, IT systems must be able to abstract into software “programmability, openness, flexibility, and the ability to have global consistency across a multitude of IT systems,” says Ulander. By having the network abstracted and independent of the physical layer, IT has that level of technological flexibility, which in turn promotes operational flexibility. Digital transformation today requires a business transformation with an open, infrastructure-agnostic IT model, as well as a cultural shift that enables organizational collaboration. 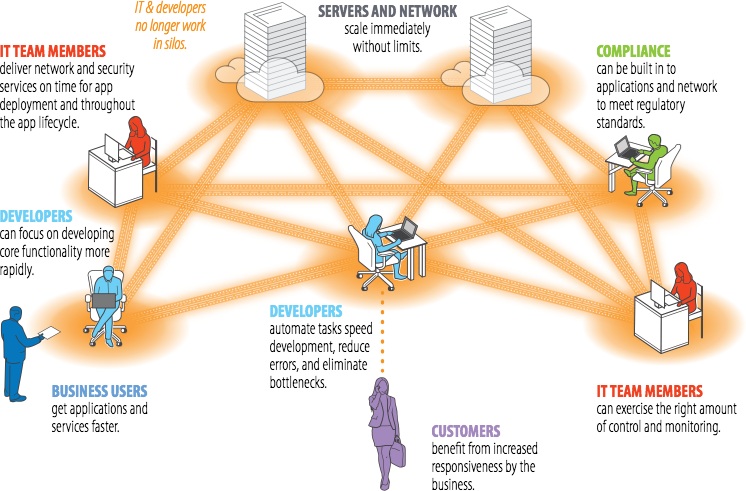 Moving from on-premises physical networks to a software-based networking model enables IT and business to better align, eliminating silos and increasing efficiency, productivity, and security. 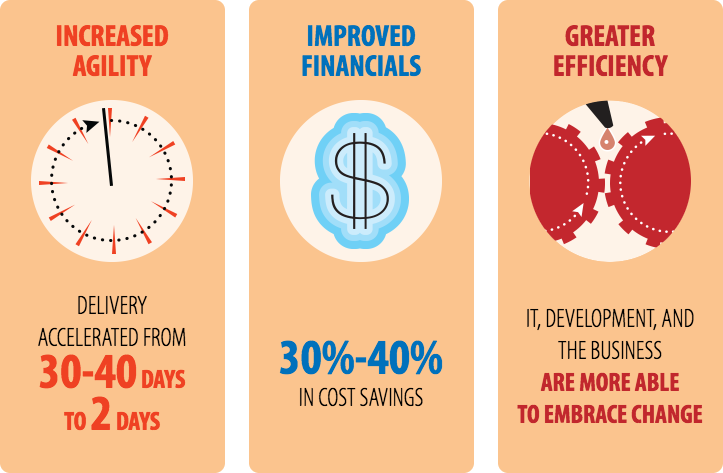 Companies like Deluxe can benefit from built-in security and IT service delivery improvements—accelerating from 30 to 40 days to a 48-hour turnover—not to mention 30 to 40 percent in cost savings. Changes in culture, process, and technology give IT the visibility and appropriate level of control over security and compliance, while helping IT meet business needs at a crucial time of digital transformation. And as IT provides a new bridge to digital transformation and an agile framework that allows businesses to be self-service, the business will also be better positioned for future development and deployment. A cultural shift and virtual networking technology in the digital transformation journey will foster innovation and a competitive edge now and in the future.